With summer just around the corner, things are starting to heat up in the retail energy industry. Just Energy, a SaveOnEnergy.com® partner provider, announced its ecobee3 smart thermostat is now fully integrated with Amazon’s Alexa Voice Service capable devices. Just Energy is the first energy provider to integrate with Alexa, and its Texas customers can sign up for its smart thermostat today. The ecobee3 is also compatible with Apple’s HomeKit, Wink, SmartThings and many more home automation devices and applications. Amazon Echo is a small, cylindrical tower-speaker that has a built-in, cloud-controlled voice assistant service called Alexa. Echo, along with the recently introduced Echo Dot and Amazon Tap, connects to the Alexa service and provides consumers with options to play music, provide weather reports, set timers and control their smart-home connected devices. For those who have Amazon’s Fire TV, the Over-the-Top streaming device can connect to the Alexa Voice Service too. Consumers can set up their devices via free Alexa Apps on Fire OS, iOS, Android and on their computers. Once configured, consumers only need to enable the Just Energy Skill and log into their account. 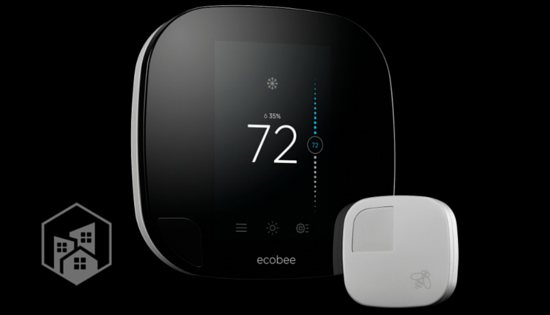 Just Energy ecobee3 customers are equipped with a smart thermostat that features DataRhythmTM technology. This means the thermostat knows when to turn on equipment based on the weather, a customer’s schedule and their own, customized energy profile. Key features of the ecobee3 include wireless remote sensors to deliver the correct temperature in the rooms that matter most and smart home detection that knows when you’re home, even if you have your thermostat set to Away. It also includes: smart recovery that uses Wi-Fi to track local weather, using the information to adjust settings for optimal temperatures when you arrive home; humidity tracking that can regulate the humidity in your home; Home IQTM that shows you your energy usage; and the ability to adjust settings when not at home.